The thing about kabobs is that you can put anything you like on the skewers, grill them to perfection, so everyone in your family can enjoy them! This recipe has a sweet teriyaki marinade that gives these chicken kabobs superb flavor! In a small bowl, combine honey, teriyaki, ginger, pepper, brown sugar, and lemon juice. Cut chicken breasts into 2-inch strips, place chicken in the marinade, and soak for 30 minutes to 1 hour. 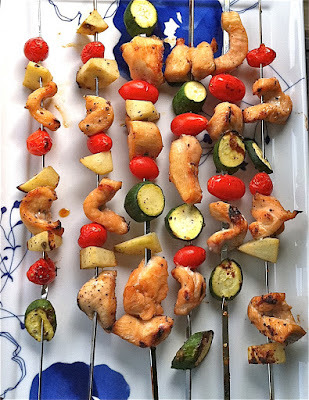 Thread vegetables and chicken on kabob skewers. Place on heated grill on medium/high heat. (I laid my kabobs on aluminum foil sprayed with cooking spray. I poked holes in the foil to allow grill flavor to seep through). Grill slow, turning skewers every 5 minutes or so until desired doneness. Remove and enjoy!!! Feel free to reserve a little bit of the marinade (before soaking raw chicken in it) to brush on after as well. If you'd like a printer-friendly version of this recipe, Click Here.